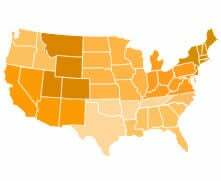 Get guidelines for placing concrete by region and season throughout the U.S. Remember the definition: If the air is below or expected to go below 40°F, then use cold weather techniques. When finishing concrete in cold weather, you still need to wait for all the bleed water to evaporate. Bleed water is basically the concrete particles settling (like mud in a stirred up pond) and squeezing out all the extra water. If you finish that water into the surface, you increase the water-cement ratio and get weak surface concrete. Since the concrete is setting more slowly in the cold, bleeding starts later, lasts longer, and you can get more bleed water. You can try getting it off with squeegees or vacuums--or you can wait. Typically, you only need to keep the blankets on for a couple of days, if the concrete is warmer than 50°F. To determine how much insulating value you need to keep the concrete at 50°F, check out the tables in Chapter 7 of ACI 306. The insulation needed is based on concrete thickness, cement content, and the lowest air temperature anticipated for the protection period. Place triple layers of insulating blankets at corners and edges that could freeze. Wrap any protruding rebars. Make sure the blankets won't blow off during the night. 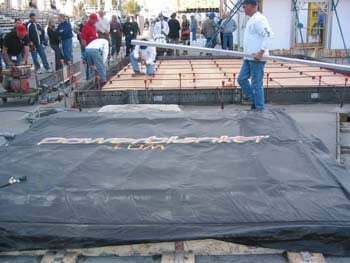 If blankets alone aren't enough to keep the slab warm (or the walls for formed concrete) then you can use hydronic heating pipes or electric heating blankets laid on top of the slab and insulated. If that's still not enough, or if it's too cold to even place the concrete, then you would need to enclose the work and heat the air. 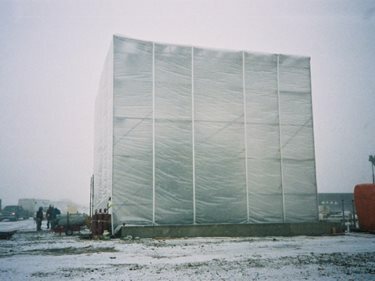 Temporary enclosures are expensive, but if the work must go forward, sometimes that's the only option. If the concrete is kept at around 50°F, protection can typically be removed after two days. If the concrete remains at 50°F, depending on what kind of cement is used and how much accelerator, you should wait a couple of weeks-better to wait 4 weeks-before actually putting it into service. You can always test to determine the strength if it's essential. 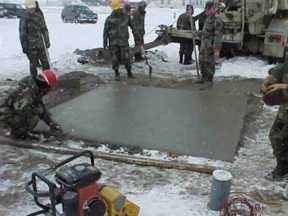 Concrete in cold weather absolutely does need to be cured-the surface can dry out even faster than in warm weather, if the concrete is warmer than the air.